How are the magnetic properties of permanent magnets specified? What are the key features of a demagnetization curve? Why are there often two different curves presented? What do the specific parameters physically mean? What are the units used in magnetism? What is a "load line"? What is the temperature dependence of permanent magnets? Why did we not get the results (e.g. lower flux, higher noise, different flux pattern, etc.) we expected? What magnetization profiles are achievable when using a bonded neo magnet? How are the magnetization profiles of bonded neo magnets different from those of other magnets? We have a magnetizer and a magnetizing fixture already. Can we use our existing equipment to magnetize bonded Neo magnets? What can I do if I need help magnetizing bonded Neo? What design capabilities Magnequench Technology Center have? Does Magnequench charge for the assistance in application or magnetic fixture design? What hardware or software does the Magnequench Technology Center have for the analysis, testing and design of magnetic application or magnetic fixture? Is it possible to replace a ferrite magnet with a bonded neo magnet in a motor without increasing the overall motor cost? How do isotropic bonded neo magnets help motor designers achieve reduced torque ripple in their applications? What are the common ways of defining the skew angle on the ring magnet? After receiving magnets from a magnet manufacturer, what are some ways to verify the consistency of the magnetics of the magnets? What data does the Magnequench Technology Center need in order to begin assisting with an analysis of a current motor design? What are the more commonly used adhesive materials for affixing an isotropic bonded magnet to the back iron of a motor? What are MQ powder's morphology? Particle Size Distribution? What's the difference between anisotropic (MQA) and isotropic (MQP) powders? How is MQ powder made? Permanent magnet materials are characterized by a hysteresis loop defining how magnetization changes in the presence of an applied field. 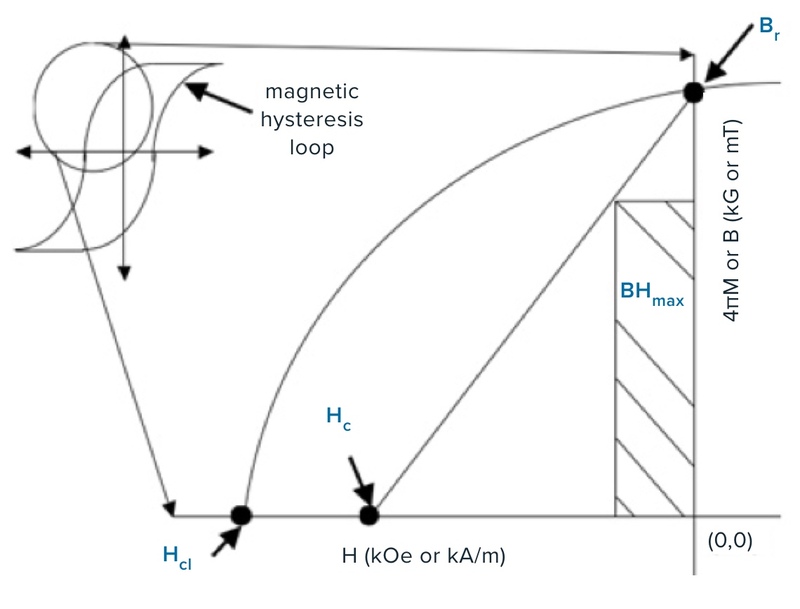 Hysteresis loops of block magnets are made in a hysteresisgraph (sometimes called a B-H tracer) and hysteresis loops of MQP™ powder are measured using a vibrating sample magnetometer, or VSM. The vast majority of permanent magnet applications operate in the second quadrant of the hysteresis loop and this part of the loop is called the “demagnetization curve” of a magnetic material. The general shape of the curve shows that the magnetization decreases slowly initially, then it drops off abruptly when the “knee” is passed. It is generally unwise to use a magnet in a demagnetizing field, which is greater than the field at the knee. So we can see that if we deliberately apply H and know either B or M then we can calculate the other. Both of them are measures of the number of lines of magnetic flux which pass through the magnet. Generally, magnetic circuit designers need to use B values and some others find it easier to use M values. Magnetization is an intrinsic measure of how strong a magnet is, and Br is a good indicator (B and J are equal at H=0). Hci is a measure of how difficult it is to demagnetize the material. Hc is the measure of what external field will prevent a magnet from providing any useful flux to a magnetic circuit. If an application has strong fields which apply a large reverse field, and then a higher value for Hci(and similarly, Hc) is necessary if the magnet is to do its job. There are two sets of units in use today; the CGS system and the SI system. The CGS unit for B (and M) is the Gauss (G) and the SI unit is the Tesla (T). BHmax is calculated by multiplying all of the discrete B and H pairs (BxH) and finding what H value produces the largest product of B times H – this is sometimes phrased “the area of the largest rectangle, which can fit underneath the normal demagnetization curve”. This “maximum energy product” is a crude figure of merit for magnetic materials and it represents the maximum energy, which can be stored inside the magnet. BHmax has the CGS unit of GaussOersted (GOe), but a million of these (MGOe) is more traditional, and the SI unit is joule per cubic meter (J/m3), but a thousand of these is more common (kJ/m3). Formally, a specific load line is a line of constant B/H represented on the demagnetization curve by a line extending from the origin outward, but physically is related to the shape of the magnet (and the air gap in the magnetic circuit). The shorter the magnet (or the larger the air gap), the lower the value of the load line. The load line represents the effect of self demagnetizing fields – stray magnetic fields from the magnet interfere with the flux lines inside the magnet, decreasing the available amount of flux. 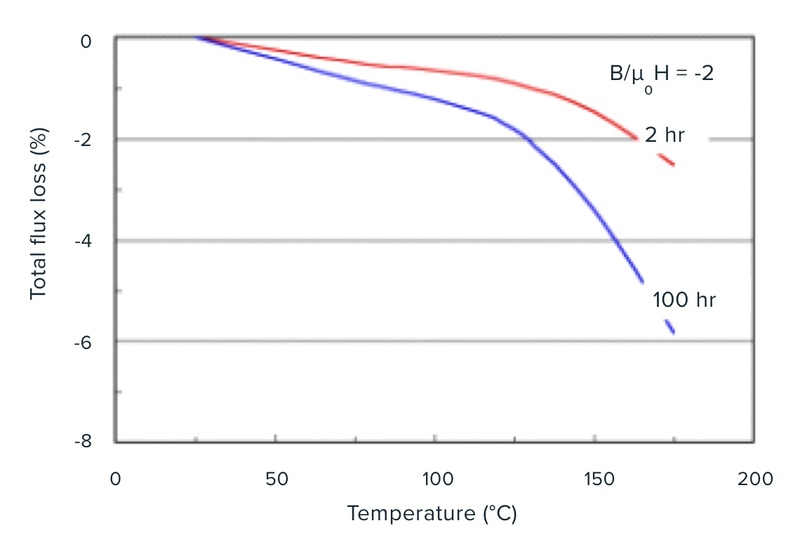 Br and Hci of RE-Fe-B materials decrease as temperature increases. It is standard to define a thermal coefficient of Br, a, and a thermal coefficient of Hci, b, both of which are defined between room temperature and 100°C. Units are %/°C. However thermal coefficients are not linear with temperature (usually 23°C), and therefore it is important to measure actual performance at the temperature of interest. Aging behavior of a magnet can be determined by the flux loss over time for a given temperature. The total flux loss is composed of reversible loss, recoverable irreversible loss and structural loss. Flux loss is incurred by a magnetization reversal mechanism occurring with increased operating temperature, as illustrated below. On cooling, part of this loss is recoverable (known as reversible loss, R), and part is not recovered and is known as irreversible loss (I). Irreversible loss is partly recoverable through remagnetization and partly permanent due to structural losses (corrosion or oxidation). Recoverable losses (R and I) are inversely proportional to the intrinsic coercivity, and tend to increase with lower Hci values. An Illustration of Irreversible Loss due to Magnetization Reversal. Note that magnets with a smaller load line (for these standard measurements, cylinders with a smaller aspect ratio) degrade more than those with a larger load line – self demagnetizing fields are more important for short magnets. The same is true for losses at the same temperature for longer times – there are larger losses for magnets with smaller load lines. There are various possible reasons for not getting the expected results after employing bonded neo magnet in an application. The bonded neo magnets may not be oriented properly (please refer to the Magnetization Guide). Bonded neo is isotropic and is oriented during magnetization. The isotropic nature of the material is also enables radial, trapezoidal, or sinusoidal – or anything in between – magnetization patterns relatively easily with an appropriately designed magnetization fixture. Without the correct design, however, at times, bonded neo magnets may exhibit lower total flux. Access to FEA design tools or experience with the magnetization of bonded neo is helpful in achieving the magnet orientation that is appropriate for good operation of a motor. The application’s magnetic circuit may not be optimized yet for a different magnetic material. Each magnetic material is unique with regard to strength, orientation, physical characteristics, etc. A motor or other magnetic circuit that has been designed for one type of magnetic material will probably not work in an optimal way with a different type of magnetic material. Often, motors utilizing ferrite magnets require 2 to 3 times the magnet mass that is required for bonded neo. If, for example, a bonded neo magnet is simply used to replace ferrite magnets without redesigning the rest of the magnetic circuit problems such as the oversaturation of soft magnetic components may arise, leading to lower than expected useful flux. The higher air gap flux of a bonded neo magnet may be causing more noise and vibration. Many of the advantages of bonded neo magnets, such as higher efficiency and smaller motor size, are derived by harnessing the higher air-gap flux density provided by bonded neo magnets compared to that provided by ferrite magnets. Unless the magnetic circuit and the magnet orientation are optimized for this higher air-gap flux density, greater cogging torque may occur. Bonded neo magnets can easily be magnetized to a variety of orientations that result in both higher efficiency and lower cogging torque. For example, you can also consider a skewed magnetization on the bonded neo magnet – something that, because of its isotropic nature, is very easy to do with a bonded neo magnet. (For methods to reduce the cogging torque, please refer Effect Of Motor Design Parameters On Cogging Torque – Part 1. Please refer the Case Study: Noise and Vibration for the causes of higher noise and vibration. If you are not getting the expected result after employing a bonded neo magnet in your application, feel free to consult the Magnequench Applications Team. With bonded neo any orientation may be achieved – radial, trapezoidal, sinusoidal, or anything in between. And since most bonded neo magnets are, generally, isotropic, the orientation of the magnet is determined during magnetization. It is, therefore, possible to try many different magnet orientations in one motor design simply by changing the magnetizing fixture. Not only is any orientation possible but also magnetizing the magnet with any desired skew angle is possible. FEA design tools or experience with magnetization of bonded Neo is helpful for achieving the best magnet orientation for good operation of a motor. Check with the Magnequench Applications Team for help with any of your magnetization questions. With bonded neo any desired magnetization profile can be achieved – radial, trapezoidal, sinusoidal, or anything in between. And since most bonded neo magnets are, generally, isotropic, the orientation of the magnet is determined during magnetization. It is, therefore, possible to try many different magnet orientations in one motor design simply by changing the magnetizing fixture. Not only is any orientation possible but also magnetizing the magnet with any desired skew angle is possible. FEA design tools or experience with magnetization of bonded Neo is helpful for achieving the best magnet orientation for good operation of a motor. Check with the Magnequench Applications Team for help with any of your magnetization questions. It may be possible to use your existing equipment to magnetize a bonded neo magnet, however the magnetization of bonded neo magnets generally requires higher energy than either sintered neo or sintered ferrite magnets. It is often the case that magnetizing equipment that is designed for the magnetization of ferrite or sintered neo magnets will not optimally magnetize bonded neo magnets. Performing an experiment to generate a saturation curve is a good way to determine if magnets are fully saturated. For more details on the magnetization of bonded neo magnets, please refer Causes And Effects of Unsaturated Bonded Neo Magnet and Factors To Be Considered to Achieve Bonded Neo Magnet Saturation. For any support on magnetization of the bonded neo magnets, please contact the Magnequench Applications Team. The Magnequench Applications Team has many years of experience designing and building magnetizing fixtures for bonded neo magnets, and we are happy to provide assistance. Our experience dates back to the earliest commercial uses of bonded neo magnets and takes advantage of the commercially available technologies such as FEA calculation of magnetization and low-impedance magnetizers. The applications team at the Magnequench Technology Center has experts with rich experience on design of various magnetic devices especially the permanent magnet brush and brushless motors, design and optimization of the magnetic fixture for magnetization of both isotropic and anisotropic bonded neo magnets. Magnequench Technology Center does not charge for the assistance in any application or magnetic fixture design if one of the following conditions is met. The application has potential to use isotropic or anisotropic bonded neo and the present evaluations are pertaining to the use of such magnets. Fixture design is for the magnetization of the isotropic or anisotropic bonded neo magnets. For applications where other types of magnets are being considered of the magnetic fixture design for the magnetization of other magnet types may be considered on a case by case basis. Interested parties can contact either the nearest Magnequench office or the Magnequench Technology Center for further details. Some of the software and hardware is as mentioned below. SPEED- Analytical software for the design of permanent magnet brushed and brushless motors. Yes, it is certainly possible, although such dynamics should be considered on a case by case basis. In short, the cost of the motor must be considered holistically. Because bonded neo magnets offer substantially better magnetic properties than ferrite magnets, for many applications, the size of the motor as well as the requirement of other active raw materials, like copper and soft iron, will be reduced significantly, resulting in lower motor cost. The desired flux profile (e.g. radial, sinusoidal, or somewhere in between) is an important consideration for any permanent magnet motor. Given the ease with which the flux profile of isotropic bonded neo magnets can be manipulated, more complex and costly manufacturing steps – such as producing a complex magnet shape or contouring the soft iron parts can be avoided. The proper skew angle is determined by the number of slots on the armature. Typically a skew angle is [360°/ number of slots] or [180° / number of slots]. The second formula results in a smaller angle and is more commonly used, since larger skew angles result in greater reduction in the output torque of a motor. Please refer to Magnetization Guide for more information. There are two alternatives: 3M Scotch-Weld 2214 Hi-Temp and Loctite 332. In a production type environment, one can consider to use the 3M Scotch-Weld 2214 Hi-Temp (original formula) when adhering a MQ1 type (bonded neo) magnet to a steel surface. This adhesive can hold up to severe shock conditions, providing great shear strength, but it requires an oven cure cycle. 3M Scotch-Weld 2214 Hi-Temp. (Original formula) requires oven cure cycle. Please note that the 3M Scotch-Weld 2214 is not a two part adhesive. The 3M Scotch-Weld 2214 also requires an oven cure cycle. 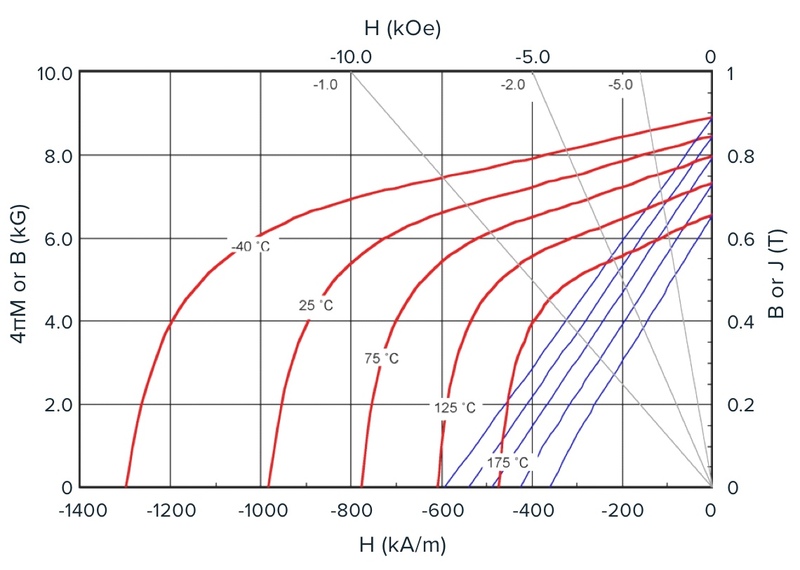 The demagnetization of the magnet due to an oven curve process will be highly related to the load line that the magnet is in while being exposed to the high temperature cure cycle. Loctite 332 is a two part adhesive that targets the permanent magnet market. It requires an activator but cures at room temperature. Two part adhesives might be a problem. They can do a good job when handled well, but introducing another variable can become an issue (too much activator can cause long term problems that cannot be detected immediately after assembly even with load testing). Surface preparation is typically a big factor. Thus, do ensure your frame surfaces are clean and void of oils, and slightly rougher surfaces (sandblasted vs. polished) typically provide much better adhesion. Coated magnet surfaces typically degrade adhesion performance, while a very smooth coated surface is the least desirable situation. When gluing a ring magnet to a hub, the application of the adhesive must be made to both the magnet surface and the hub surface as application to one surface does not provide proper wetting of the adhesive to the other surface when the two parts are joined. If not, one might not get the expected performance. Also a consistent glue gap around the full circumference of hub/shaft is important. One can either consider wounding up with the use of piano wire as spacers between the ring magnet ID and the hub or use fixtures to keep the ring concentric with the hub. If your process cannot tolerate an oven curve process, then the Loctite 332 might be a good starting point (assuming its published properties meet the needs). Please visit the respective 3M and Loctite website if you wish to find out more about the properties of the recommended adhesives. Magnequench offers MQP powder in a variety of shapes and sizes. Most products are flake shaped and can range from -40Mesh and down to -150M and down. MQP can also be made with D50 as low as 5 mm, and these products are called MQFP. For more information, please refer to Particle Size Distribution. Isotropic MQP powder gives the same magnetic properties is all directions, and therefore this grade of powder does not need to be aligned when being consolidated into a magnet. Anisotropic MQA powder does have a preferred orientation though. This material has been designed such that it has vastly superior flux density (or remanence) in one particular direction. Therefore, when preparing magnets from anisotropic MQA powder, one has to align the powder with a magnetic field in the preferred direction during molding to take full advantage of its higher magnetic strength potential. Magnequench powders are produced by a rapid solidification process known as melt-spinning. Please refer to Our History for more information.